Writing good code starts with building a rich development environment using the best tools. When I began building websites I preferred an IDE (Adobe Dreamweaver, specifically) for the out-the-box functionality. My needs soon outgrew the Dreamweaver GUI and a friend of mine convinced me that to become a better programmer I should use the command line. So, I started along the path to learning linux. Today, I'm convinced that to maximize any dev environment intermediate knowledge of Linux is a sine qua non. This is not to say that the best development environment doesn't use any GUIs. Many services provide excellent GUIs which provide additional benefits and advanced features. Many developers (myself included) prefer to use non-CLI text editors (textmate, webstorm, textwrangler and coda seem to be most popular). Other developers use the Github GUI, which is capable of executing most of the available git commands. To each it's own, but when making the decision between using a GUI or CLI, consider carefully how much control you will need. Dock gives you some dotfiles to really get you going, including the screenshot above (my shell is based off of this repo). 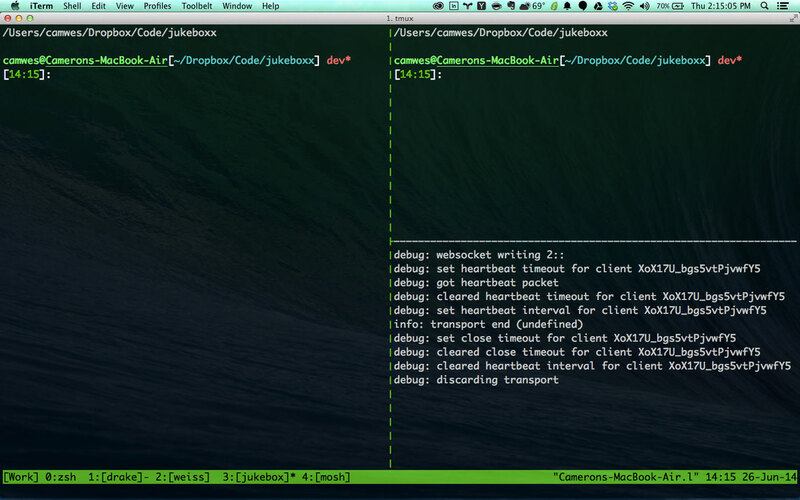 The files are rsynced in the install process and is an emacs/zsh/tmux shell. Customize it as much as you want, but I like my setup. Even better, brew can also install your GUI apps using brew cask. Many apps are added everyday so check out what's available here or check out the casks installed with this repo. node-inspector: An amazing plugin that allows you to use chrome devtools on server code. You may also want to consider yeomon, an application generator. This service installs works with bower and grunt but adds the benefit of basically doing what I've done in this repo and providing you with biased app structures (generators) to choose from. In due, time I will create my own Yeoman generator for this boilerplate. If you've developed for a while you probably hate the process of constantly refreshing your browser once pages have been updated. This is a thing of the past with LiveReload. Install their app or browser extensions. The gruntfile.coffee can be updated to enable livereload when changes are made to the static directory when you "grunt watch". As a developer I began making websites with zero server administration experience. I used commercial web hosting services that were both terribly interfaced and extremely limited (GoDaddy, Yahoo, etc.) As the sophistication of the things that I decided to build began to outgrow these services I decided that it was worth my time to learn to deploy a site using Amazon Web Services. Many of the webs most successful companies (Netflix, Tumblr, etc.) and most startups heavily rely on AWS, as it is very competitively priced. Unfortunately, for most front-end developers, learning to use these services is a daunting task. For the nitty gritty details on exactly what this script does, please refer to my previous blog post. But getting the server set up isn't the end of server deployment. Since you are already clearly an expert at Git by now why not use git to improve your server deployment process? Git is actually an excellent tool for this, but requires a slightly more advanced usage of git and understanding of shell scripts. Chances are you need a little more information than that about how github deployment works, which is also in my devops post. Who am I to tell you how to configure your stack? Well I'm going to do it any way. Read my review of text editors for more feedback on tools.